Hey everyone!!! 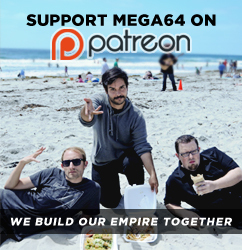 Time for the next Mega64 podcast, In this episode: We talk about the Oscars and all the movies that were and were not nominated. Derrick also tries to convince us that we have the story in Beauty and the Beast all wrong. What would be the best cliff to poop on and did Shawn do CBD? Click here for the audio version! Before you go, make sure to check out our new 64 Hour Special!!! Get it now before it's too late! !